Within the show's narrative, the Doctor is a centuries-old Time Lord from the planet Gallifrey, who travels in time and space in his TARDIS, frequently with companions. At the end of life, the Doctor can regenerate his body; in doing so, his personality and physical appearance change. The Doctor is a very special part, and it takes a very special actor to play him. You need to be old and young at the same time, a boffin and an action hero, a cheeky schoolboy and the wise old man of the universe. As soon as Matt walked through the door, and blew us away with a bold and brand new take on the Time Lord, we knew we had our man. Executive producer and head writer Steven Moffat on Smith's casting. David Tennant announced at the National Television Awards on 29 October 2008 that he would be stepping down from portraying the Doctor because he felt that the four years he spent portraying the character was enough. At the time, BBC News published that Paterson Joseph, who appeared in the Doctor Who episodes "Bad Wolf" and "The Parting of the Ways", was the bookmakers' favourite to succeed Tennant, followed by David Morrissey, who would be appearing in the 2008 Christmas special, "The Next Doctor". Other candidates included Sean Pertwee, son of Third Doctor actor Jon Pertwee; Russell Tovey, who portrayed Alonso Frame in the 2007 Christmas special, "Voyage of the Damned"; and James McAvoy. Although Steven Moffat anticipated choosing a middle-aged actor for the new Doctor, Smith was aged 26 when cast. This made him the youngest actor to portray the Doctor, three years younger than Peter Davison was at the time he began his role as the Fifth Doctor. Show producers were cautious about casting Smith because they felt that a 26-year-old could not play the Doctor adequately; BBC Wales Head of Drama Piers Wenger shared the sentiment, but noted that Smith was capable enough to play the role. Smith's casting in the role was revealed during an episode of Doctor Who's companion show Doctor Who Confidential, during which he described the role as "a wonderful privilege and challenge that I hope I will thrive on". The Eleventh Doctor spends most of his first full episode, "The Eleventh Hour", in the tattered remains of the Tenth Doctor's clothing, leading young Amelia Pond to nickname him "the Raggedy Doctor." The Doctor's initial outfit, chosen within the narrative of "The Eleventh Hour" from an array of clothes found in a hospital, is a brown tweed jacket with elbow patches, bow tie, braces, black trousers and black, ankle-high boots. He has a fondness for bow ties and fezzes, proclaiming them as "cool." The details of the outfit vary, switching from a braces and bow tie combination in red to the same in blue. In later stories, a green military coat makes its way into the Doctor's ensemble, occasionally replacing the Harris jacket. On other occasions he does not wear a coat and wears a bow-tie and dress shirt. After the Doctor loses his original tweed jacket in the episode "Flesh and Stone" he replaces it with a plain brown jacket which he wears until the Christmas special "A Christmas Carol", which aired the Christmas after the eleventh Doctor's first series. 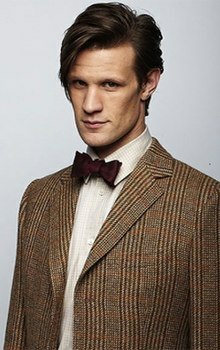 In this episode the Doctor wears his most famous "Prince of Wales check" tweed jacket which he wears, with some switching to a green military coat, until parting ways with Amy and Rory in "The Angels Take Manhattan". In "The Big Bang", the Doctor briefly dons a fez, stating, "I wear a fez now, fezzes are cool." This began a running gag with "cool" headgear, including a Stetson hat, a Victorian-era top hat, and the recurring fez. After appearing in Victorian period clothing throughout "The Snowmen", the Doctor rejects his tweed jacket ("The Bells of Saint John") in favour of a purple-brown cashmere frock coat and a variety of waistcoats, and generally more sober colours of shirt and bow tie. Amy Pond's reading glasses, which were left behind with the Doctor after Amy and Rory's departure in the episode "The Angels Take Manhattan", are also occasionally worn. In an interview with Doctor Who Magazine, Steven Moffat revealed that the Eleventh Doctor had an entirely different costume until close to the start of filming. The original look had a swashbuckling feel which Doctor Who Magazine editor Tom Spilsbury described as "a little like something Captain Jack Sparrow wears in the Pirates of the Caribbean movies". However, Matt Smith was unhappy with the costume as he felt it reflected how someone else would dress the Doctor, rather than how the Doctor would dress himself. Smith also mentioned in a 2012 interview that his Doctor was going to have a "very long black leather jacket, but it was too Matrix-style". The eventual costume, in particular the bow-tie, was influenced by Patrick Troughton's Second Doctor, after Matt Smith fell in love with the Troughton story The Tomb of the Cybermen. Steven Moffat describes the Eleventh Doctor as an "old man trapped in a young man's body" and Matt Smith characterises him as someone with "a lot of blood on his hands" who copes via constant travelling and thrill-seeking. The Eleventh Doctor first appears in the final scene of The End of Time (2010) when his previous incarnation regenerates. 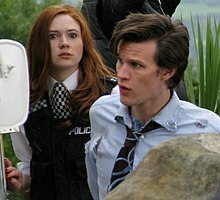 Smith debuts fully in "The Eleventh Hour", where he first meets Amy Pond (Karen Gillan) as a child while investigating a mysterious crack in her wall. Many years later, Amy joins the Doctor as his travelling companion on the eve of her marriage to Rory Williams (Arthur Darvill). In "Victory of the Daleks", he is tricked into spawning a new generation of Daleks. In "The Time of Angels"/"Flesh and Stone", he re-encounters future companion River Song (Alex Kingston) and his enemies the Weeping Angels, and learns that cracks like the one in Amy's wall are erasing individuals entirely from time and space. After Amy attempts to seduce the Doctor, the Doctor recruits Rory as a second companion from "The Vampires of Venice" up until "Cold Blood", where he is killed protecting the Doctor and is erased from history. The Doctor also confronts his dark side in "Amy's Choice", where he is put through trials by a manifestation of his self-loathing, the Dream Lord (Toby Jones). In the final episodes "The Pandorica Opens" and "The Big Bang", an unknown force makes the TARDIS explode, causing the universe to collapse in on itself. Though he closes the cracks —reversing their effects and preventing the explosion— the Doctor himself is erased from history. River assists Amy in remembering the Doctor back into existence; he returns at her wedding to Rory, and the couple rejoin him as his companions. He next appears later in Death of the Doctor, a two-part story of spin-off series The Sarah Jane Adventures, alongside former companions Sarah Jane Smith (Elisabeth Sladen) and Jo Grant (Katy Manning), while Amy and Rory are on honeymoon. Series 6 in 2011 continues to examine mysteries left unexplained at the end of Series 5. In "The Impossible Astronaut"/"Day of the Moon", Amy, Rory and River witness a future version of the Doctor murdered, which they vow to keep a secret from the present-day Doctor as they encounter hypnotic aliens called "the Silence". Eventually, Amy unknowingly lets slip that the Doctor dies in "The Almost People", when it also turns out that she is pregnant and has been kidnapped by the nefarious Madame Kovarian (Frances Barber). In "A Good Man Goes to War", the Doctor calls in old favours from across time and space to raise an army to rescue Amy from Demons Run, an asteroid in the 52nd century being used as a base by a religious order, but is unable to rescue her child, Melody Pond. The Doctor also learns that Melody—though Rory and Amy's child—is part Time Lord due to being conceived in the TARDIS, and will grow up to become River Song. In "Let's Kill Hitler", the Doctor encounters a younger iteration of River and learns she has been conditioned by the Silence, explained to be a religious order, to assassinate him. She nearly succeeds using a kiss of poisoned lipstick before Amy convinces her to save his life instead. The Doctor also learns the circumstances of his death from historical records on a time-travelling shape-shifting robot ship called the Teselecta. 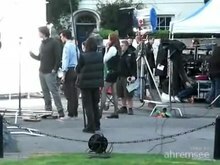 In "The God Complex", the Doctor leaves Amy and Rory on Earth when he realises Amy's apotheosis of him endangers their lives. Some time passes before the Doctor is ready to confront his death. In "The Wedding of River Song", he devises an escape by concealing himself within the Teselecta, which is disguised to look like him, to make it seem he is shot and burned as history records. In a doomed alternate reality caused by River's reluctance to shoot the Doctor, the two become married; during the ceremony, she is let in on the Doctor's original plan and helps fake and corroborate his death. The Doctor is then warned by his old friend Dorium Maldovar (Simon Fisher Becker) that more prophecies still concern him. The Doctor learns he will be asked the oldest question in the universe, "Doctor who? ", on the battlefields of Trenzalore; the Silence had intended his death to prevent this. In the Christmas special "The Doctor, the Widow and the Wardrobe" (2011), the Doctor has Christmas dinner with Amy and Rory, who had been informed by River of his survival. They unite again in the Series 7 premiere "Asylum of the Daleks" (2012), in which the Doctor is erased from the Daleks' memory banks due to the actions of Oswin Oswald (Jenna-Louise Coleman), a young woman turned Dalek who had retained her human mind; she subsequently dies. The Doctor then takes Amy and Rory on several adventures, eventually taking them back on as full-time companions in "The Power of Three" before losing them during the events of "The Angels Take Manhattan". The Doctor subsequently "retires" to a secluded lifestyle in Victorian London, until the 2012 Christmas special "The Snowmen," when he is inspired to save the world by a barmaid/governess called Clara (Coleman) who he considers an ideal companion. Mid-adventure, Clara dies, and when the Doctor sees her tombstone, reading "Clara Oswin Oswald", he realises that Oswin and Clara are the same woman in different moments of time. He resolves to find her again in another era. The Doctor succeeds in "The Bells of Saint John", saving a present-day version of Clara Oswald from agents of the Great Intelligence. He takes her as his companion and attempts to solve the mystery of "the Impossible Girl". The Doctor eventually gets his answer in "The Name of the Doctor" when he is forced by the Great Intelligence to go to Trenzalore, revealed to be planet on which the Doctor will die. Within the Doctor's tomb, the Great Intelligence uses the dead Doctor's remnants—his disembodied "timestream"—to spread himself across the Doctor's history, turning his victories into defeats. Clara pursues him and is scattered throughout the Doctor's timeline creating Oswin Oswald and Clara Oswin Oswald among numerous other incarnations who undo the Great Intelligence's work. The Doctor has a mournful conversation with River's apparition, giving her closure before entering the timeline to retrieve Clara. However, once he saves her, the Doctor is forced to reveal the existence of a previous incarnation (John Hurt) who broke the promise represented by the name "Doctor" during the Time War of his past. In the show's 50th anniversary special, while investigating a strange occurrence in beneath London's National Gallery, the Doctor encounters his past incarnation who fought in the Time War (John Hurt) as well as his immediate previous incarnation (David Tennant). Though the older Doctors berate the 'War Doctor' for his killing both Time Lords and Daleks with a sentient weapon known as the Moment, they ultimately choose to support his decision and forgive themselves for this past atrocity. Led by the Moment into the midst of the Time War, the Doctors realise they have the potential to change its outcome and enlist the aid of their previous incarnations in an uncertain bid to save Gallifrey from destruction. They place the planet in stasis and transport it to a pocket universe, making it appear to be destroyed. As an effect of time travel, only the Eleventh Doctor will remember saving Gallifrey; he learns from a cryptic curator (played by Tom Baker) that his plan worked. In "The Time of the Doctor," the Doctor is lured to what he learns is the planet Trenzalore to decode what he discovers is a message from the displaced Time Lords through the last remaining crack in the universe: the oldest question in the universe, "Doctor who?". Learning that the verification of his identity would allow the Time Lords to return, the Doctor finds out that the signal caught the attention of an assortment of his enemies, who wish to prevent Gallifrey's return, and the powerful Church of the Papal Mainframe, who wish to destroy the planet and avoid the possibility of a new Time War. After attempting to send Clara back to her time, the Doctor spends centuries defending the planet from alien incursions. During this time, a faction of the Church led by the Silence breaks away and attempts to avert these events by destroying the Doctor earlier in his timeline, as seen in series 5 and 6. The Doctor also reveals to Clara he has no regenerations remaining and will likely die in the siege. The siege escalates into all-out war and after centuries pass, only the Daleks remain. Though the heavily aged Doctor anticipates his predestined death on the battlefields of Trenzalore, Clara convinces the Time Lords to give the Doctor a new regeneration cycle as he uses a fiery blast of regenerative energy to destroy the Dalek mothership. The Doctor regains his youth before retiring to the TARDIS to complete the process. He hallucinates a final farewell to Amy Pond and delivers a eulogy to his present incarnation, before abruptly completing his transition into the Twelfth Doctor (Peter Capaldi). He made a reappearance in "Deep Breath" (2014). While adjusting to the new Doctor, Clara receives a phone call from the Eleventh Doctor made moments prior to their final meeting. He asks her to help his new self and not to be afraid of him. Like the Tenth Doctor, the Eleventh and Amy (and later Rory) appear in New Series Adventures novels in 2010. The first of these is Apollo 23 by Justin Richards, as well as the Decide Your Destiny series of interactive novels. The character also appears in comic books published in Doctor Who Magazine, Doctor Who Adventures, and he took over from the Tenth Doctor in IDW Publishing's Doctor Who series before BBC Worldwide awarded the license to Titan Magazines. He'll continue to appear in these, as will the Tenth and Twelfth Doctors in their own stories. He appeared in the crossover series Star Trek: The Next Generation/Doctor Who: Assimilation2, where he was working with the crew of the Enterprise-D to defeat a Borg/Cybermen alliance. The Eleventh Doctor also appears in a series of audiobooks. The first release of these is The Runaway Train by Oli Smith. In 2018, Big Finish launched the Eleventh Doctor Chronicles range with four stories narrated by Jake Dudman. Characters from the Eleventh Doctor era who have reprised their role include Dorium Maldover (Simon Fisher-Becker) and Kazran Sardick (Danny Horn). In addition, Winston Churchill (Ian McNeice), Lily Arwell (Holly Earl) and Madame Vastra (Neve McIntosh) have reprised their roles for Big Finish in Eleventh Doctor stories of The Churchill Years boxsets. The Eleventh Doctor is the first of the Doctors to appear in full-on action adventure games. Doctor Who: The Adventure Games is composed of four stories ("episodes"), produced alongside the 2010 series. Smith and Gillan lent their voices and likenesses. The first, City of the Daleks, carries on from the TV episode "Victory of the Daleks" and is a stealth and puzzle game set in 1960s Earth and the Dalek planet of Skaro. The second, Blood of the Cybermen, is the Eleventh Doctor and Amy's first Cyberman story. The third episode is the video game TARDIS, and the fourth is The Shadows of the Vashta Nerada, featuring the titular enemy return in an underwater setting. The fifth Adventure Game The Gunpowder Plot was released on 31 October 2011, again featuring Matt Smith's voice. In May 2012, The Eternity Clock was released for PlayStation 3, PlayStation Vita, and PC, starring Matt Smith and Alex Kingston. Matt Smith's portrayal of the Doctor was met with critical acclaim. Martin Anderson of Shadowlocked claimed him to be the best Doctor since "Tom Baker practically redefined the character in the 1970s". Smith's performance in "Flesh and Stone" was acclaimed by fans and critics. In his review for The Daily Telegraph, Gavin Fuller noted that "Matt Smith's 'quick-paced delivery' is 'a major facet' of the success of the current series." In his review of "The Big Bang", Fuller once again praised Smith's acting. "Matt Smith was superb in his scenes where the Doctor sacrifices himself in the Pandorica to rescue the multiverse". Kyle Anderson of Nerdist wrote "I don't know about you all, but the Eleventh Doctor was MY Doctor." Dan Martin of The Guardian also claimed Smith as "my ultimate Doctor." ^ Doctor Who: Best of the Companions! (Television production). BBC America. 28 August 2011. ^ "New Doctor actor is youngest ever". UK: BBC News. 4 January 2009. Retrieved 3 January 2009. ^ a b c "Matt Smith is the New Doctor". Press Office. UK: BBC. 3 January 2009. Retrieved 3 January 2009. ^ "David Tennant quits as Doctor Who". News. BBC. 29 October 2008. Retrieved 3 January 2009. ^ "Doctor Who: The runners and the riders". News. UK: BBC. 30 October 2008. Retrieved 3 January 2009. ^ Lewinski, John Scott (3 January 2009). "Announces Matt Smith as Next Doctor Who". Wired. Retrieved 2 January 2010. ^ "The Eleventh Doctor". Doctor Who Confidential. Series 4. Episode 15. 3 January 2009. BBC. BBC One. ^ "His time has come: New Doctor Who Matt Smith begins filming with his gorgeous young redheaded assistant". The Daily Mail. UK. 20 July 2009. Retrieved 20 July 2009. ^ "Matt Smith – One Plus One Interview" (Interview). YouTube.com. Retrieved 29 June 2014. ^ Eames, Tom (4 August 2013). "'Doctor Who' casting: You want to shock people, says Steven Moffat". Digital Spy. Retrieved 26 December 2013. ^ Annaliza Savage (24 March 2010). "Exclusive: New Time Lord's Take on Doctor Who". Wired. Retrieved 26 December 2013. ^ James T. Cornish (1 August 2014). "Doctor Who Series 8: Everything We Know So Far " Page 9 of 15". Whatculture.com. Retrieved 9 August 2014. ^ William Martin (4 August 2014). "'Doctor Who' news summary: Everything we know so far about Peter Capaldi's Doctor". CultBox. Retrieved 9 August 2014. ^ "Doctor Who series 8: Mark Gatiss on Peter Capaldi's Doctor". Den of Geek. 1 August 2014. Retrieved 9 August 2014. ^ "'Doctor Who': Steven Moffat Teases 'Doctor Rude'; New Season 8 Images". Screenrant.com. Retrieved 9 August 2014. ^ "Out of Time". Doctor Who Confidential. 26 June 2010. 42 minutes in. The Doctor: Something drew the TARDIS to this particular date and blew it up. Why? And why now? The Silence, whatever it is, is still out there. ^ Steven Moffat, Saul Metzstein, Denise Paul, Marcus Wilson (18 May 2013). "The Name of the Doctor". Doctor Who. BBC. ^ "Doctor Who travels to Titan Comics". BelfastTelegraph.co.uk. 22 January 2014. Retrieved 29 June 2014. ^ "Doctor Who: The Adventure Games". Retrieved 4 November 2011. ^ Anderson, Kyle (25 December 2013). "DOCTOR WHO Review: The Time of the Doctor (SPOILERS!)". Nerdist. Retrieved 4 January 2014. ^ Martin, Dan (24 December 2013). "Matt Smith was my ultimate Doctor, and I'll miss him". The Guardian. ISSN 0261-3077. Retrieved 22 February 2016. Wikimedia Commons has media related to Eleventh Doctor. "The Eleventh Doctor", Doctor Who Series 4, BBC . "The Eleventh Doctor", Doctor Who Series 5, BBC .